The popularity of face masks seems to have exploded over the last year or so and they’re about to be taken to the next level. In the form of glitter face masks. While we’re already seeing the glitter trend in festival makeup now you can lather your entire face in the stuff to improve your skin. Face mask experts Glam Glow announced this week their newest sparkly collection. Which will be in stores and online in Sephora just in time for Christmas. This face mask is jam packed full of little stars and glitter with a charcoal coloured base. You better believe that we’ll be seeing Youtubers galore trying out this cosmic product. The thought of having so much glitter everywhere may be slightly horrifying but as it turns out this is a peel off mask which they bravely state will leave nothing behind. The brand said the same technology that created their viral gravity mud product is used. Your skin should be lifted, tightened and toned after using this face mask. The glitter is cosmetic-grade glitter so you also don’t have to worry about using it on your face. When you’re done you just peel it off and throw it in the trash. 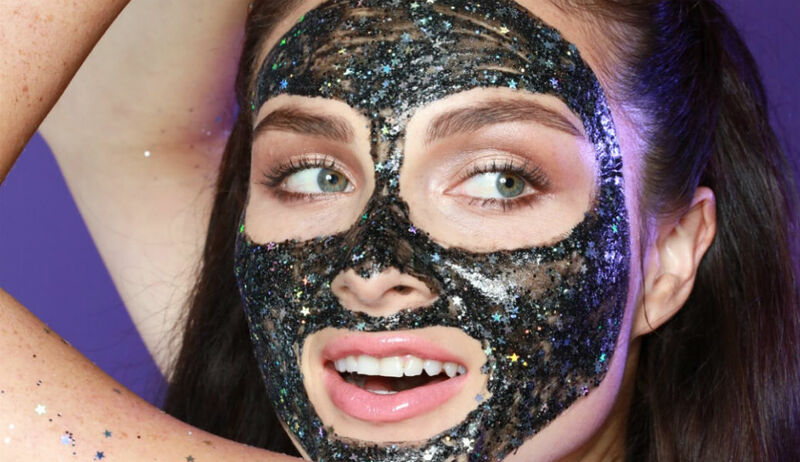 As it turns out there may be even more glittery goodness to look forward to before the year is done as Too Faced also teased a glitter face mask on their own Instagram account. It looks like there’s going to be a lot of glitter in our future and we’re living for it.